The tour started with a rendezvous of our eight tourists, in the Loire valley at one of our favourite producers, Domaine Huet in Vouvray. We were treated to an extensive tour of the ancient winery that is carved into and under the limestone hillside and ultimately supports one of Huet’s main three vineyards. The wines vary in style and age tremendously and they famously make dry, medium and sweet (moelleux) wines from each of their three vineyards in the appellation – Clos De Bourg, Le Haut Lieu and Le Mont – to be honest they are all knock out chenin blancs! After a very enjoyable evening in nearby Chateau at Domaine de la Tortiniere and an evening exclusively focussed on the red and white wines of the Loire valley, we retired to prepare for the long drive to Bordeaux after breakfast. Those driving without a troublesome Aston Martin arrived in Saint Emilion in time for lunch – the others managed to arrive for tasting one at Chateau Angelus for 14.30! 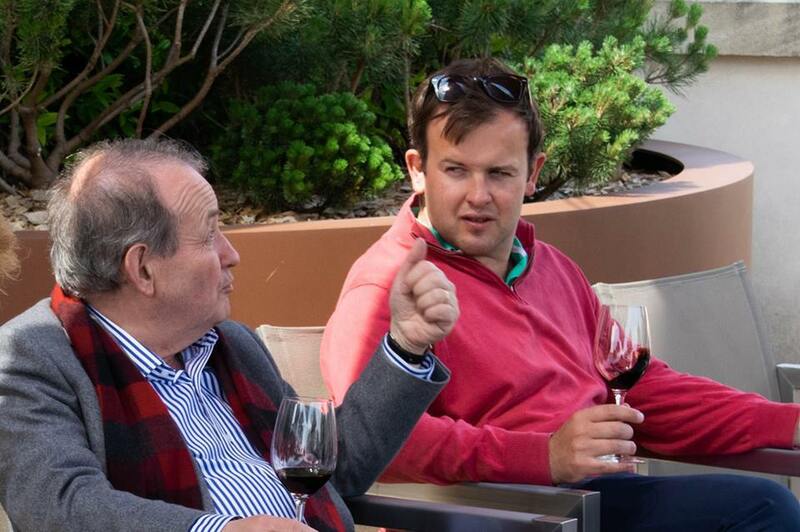 The Angelus tasting was hosted by one of the senior owning family members, Jean-Bernard Grenie, (pictured below with Charles Waud) who treated us to an extraordinary tour which started with the playing of the famous 21 Angelus bells to ‘God Save our Queen’ and ended with a private and intimate tasting of the 2011 vintage on a private sun terrace – an altogether magical and memorable experience for all and a blow away wine (that retails for around £ 300 per bottle) exhibiting soft and complex notes and very evident resolved Cabernet Franc in the cepage. Our second tasting of the day was at the neighbouring property of Chateau Canon, one of our topical investment wine suppliers. This Chateau has 24 hectares under vine for its top wine (70% Merlot, 30% Cabernet Franc) and is again a Premier Grand Cru Classe producer. We also sampled the second wine, Croix Canon which has 10 hectares of vines in adjoining vineyards of similar high quality. We were well looked after by Jean-Basile Roland who also represents the fine wines of Rauzan-Segla which like Canon is in the Chanel stable. The first of our two nights staying in central Bordeaux at the Hotel Burdigala was followed by a special and exquisite meal in one of the city’s finest and oldest restaurants, Le Chapon Fin. Here we were treated to a tour of the wine cellars and a champagne tasting along with our Négociant guests and celebrated Josie Drabwell’s birthday – yes, we did know after all! 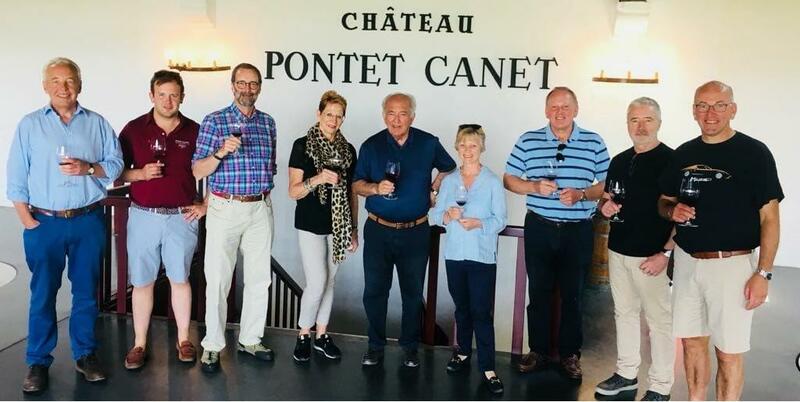 Day three on Friday was all about the highly prized left bank and started with one of our favourites – Chateau Pontet Canet, where David Ornon (pictured in the vineyard below) looked after us very well and showed us around the fabled 80 hectare single wine fully biodynamic estate. The investment in buildings, technology and equipment is at a staggering level, as is articulated by the 65 huge smooth cement fermentation tanks and yet more cement ageing tanks to intersperse with oak fermentation and ageing barrels to give this wine its unique character. We were honoured to be joined at the tasting by the vineyard owner Alfred Tesseron who was clearly keen to show us more than the recent 2017 and interesting 2011 wines – something we were keen to do, however lunch at the Café Lavinal in Bages (in the shadow of the new Lynch-Bages winery) sadly beckoned. 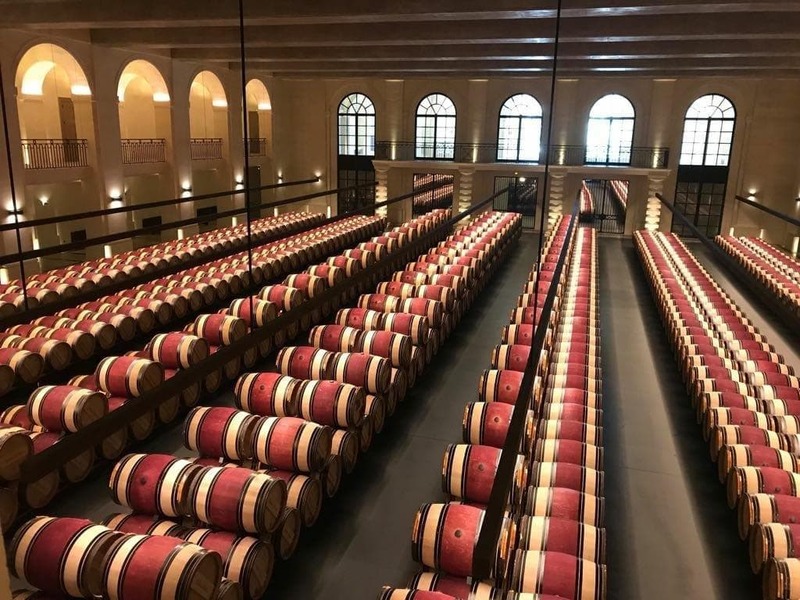 The first afternoon tasting was at none other than Chateau Mouton Rothschild, who’s extraordinary barrel ageing hall adjoining the winery to the chateau boasted 1000 x 300 litre oak barrels of the 2017 vintage. Some crude mathematics puts this haul at around 225,000 bottles of wine that release En Primeur at around £ 350 per bottle – hence nudging onto a haul of £ 80million of wine from just one vintage! The private tour of the museum and seeing the original works of art by Picasso (1974), Cesar (1967), Andy Warhol (1975), Prince Charles (2004), Anish Kapoor (2009) and others was a real treat – sadly no cameras allowed. After all that culture the final treat was to sample the 2017 En Primeur wine which displays great finesse and elegance and very little aggressive tannin from is predominantly cabernet sauvignon fantastic blend – let’s hope we get a good allocation for our investors this year. Our final tasting was at Chateau Montrose, one of the stars of Pauillac neighbour on the left bank – Sainte-Estèphe. Another substantial and highly impressive chateau with its 60 hectares of vines surrounding the vineyard on all sides and with views to the nearby banks of the river Gironde as it winds its gargantuan way south and eastwards towards the city of Bordeaux, around an hours dive away. We tasted the big long ageing organic wines of Montrose, its second wine La Dame de Montrose and nearby sister wine, Tronquoy-Lalande. All were sampled in both 2011 and 2017 vintages to challenge our weary yet somehow still eager palates. This was a spectacular tour with a really great party and one that we plan to repeat with some variation in the multiple chateau selection one is spoilt with, when travelling around this immense wine growing region. 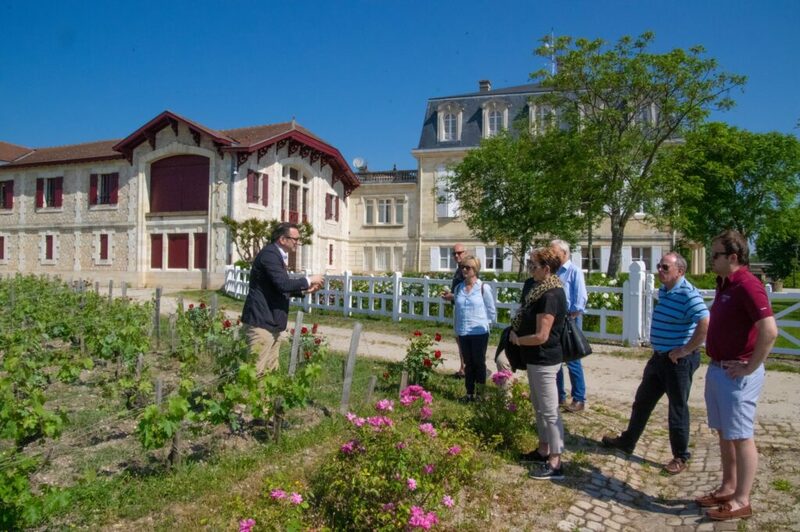 The tours in future years will probably be reserved for those who are electing to invest in Bordeaux wines – fortunately all eight of us on this tour are already investing – and our continued investment secures our privileged access to many otherwise off-limits Chateaux.